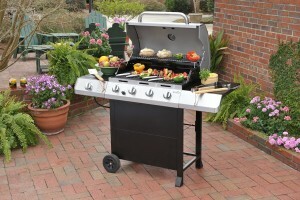 Many options exist for entry gas grills in today’s market. 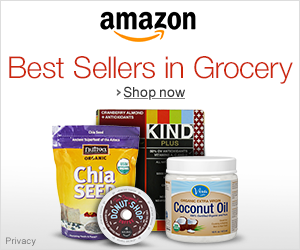 The majority of the se can be found at the Big Box Stores. Now, whenever you go to these stores you essentially have to choose based off of appearance and the supposedly knowledgeable employees at the Big Box Stores. You can always write down the most promising models, and then do research later to decide your best grill. All told, buying grills in person is becoming increasingly unsatisfactory in the age of the internet. Let us be honest now. Most entry level models in any market are risky buys. They are all made in China. They undercut each other on price for a reason, they are cheap. Think of all the kitchen appliances and cheap clothes you have likely bought in your life. Maybe a few surprises exist here and there, but most end up being little used or breakdown unbelievably fast. 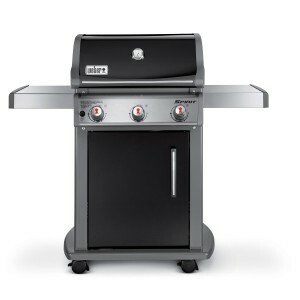 One of the most popular entry level gas grills on today’s market is the Char-Broil Classic 480 Gas Grill. From the initial outlook, I am impressed by this Char-Broil Grill. It looks great with its stainless steel/chrome finish. The grill has 484 square inches of grilling space which is more than enough for the needs of even a large family. And it is simple to assemble right out of the package. Determining whether or not the Char-Broil is the right grill for you does take some thought. Are you looking for a grill that can go for the long haul? How much quality do you want built into your grill? Will you be using your grill primarily for your family, or do you need an entertaining/tailgating grill? Plenty of questions come up in anyone’s mind before making an investment of a few hundred dollars, keep reading below to find if this the grill for you. Costing less than $200, the Char-Broil Classic Gas Grill really does pack a punch for its price tag. 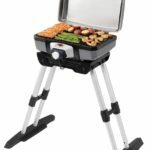 In my view, the Char-Broil is one the best multipurpose grills for anyone just looking for a low cost dependable grill. First and foremost, it functions well as an at home grill for the family. You will be able to cook multiple times a week on this grill without any issue. As an added bonus, this grill works fairly well as an entertaining grill. It can reliably cook for up to ten people. With the wheel design on the bottom it makes it easier to haul to tailgates, but is not exactly seamless. The single most important quality of any grill is how well it actually cooks your food. I am happy to report that the Char-Broil Classic Grill performs well. If you like that clean propane grilled taste, the Char-Broil will meet your needs and maybe even exceed them. 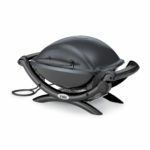 The grill builds up heat fast and retains it well. As a result, you will get nice sear marks on your meat and vegetables. With 480 square inches of prime grilling space, you will be able to definitely meet the needs of a family and then some. When it comes to grills, I just love that chrome look. Char-Broil does not disappoint in the looks department. I would rate it a solid 7 out of 10. Unfortunately this grill hides behind a veneer of class. It looks like stainless steel, it is not actually made of it. Nonetheless, I would not at all be embarrassed by having this grill on my patio. Some of those lower tier grills made of plastic and pig iron just shout cheap. This Char-Broil Grill does not at all, it looks like a standard American patio grill. This is not one of those single summer grills. Expect to get a few good years out of this grill at the very least. Now, I live in the desert so metal lasts a bit longer out here. Nonetheless, many owners of the Char Broil have reported a long and happy relationship with this grill. Little bits here and there will breakdown, but the core of this grill will continue to perform. In order to get the longest lasting life from your $200 grill, you need to put in the elbow grease and proper care to make sure it stands up to the elements. First and foremost, be sure to clean that grill up after each cleaning. Scrub the grates and wipe down the inner metal surface with a damp cloth. Heavier cleaning should be done every so often, just be sure to avoid having gunk buildup on your grill. Protecting the outside of the grill is important in windy and wet environments, so be sure to get a grill cover to protect your grill from exposure to wear as rust is a serious concern. The joys of assembling a grill from the contents of a box varies from purchase to purchase. Char-Broil does a fairly good job when it comes to assembling their products. All you will need is a Phillips Screwdriver to fasten joints together. Assembly with two people makes everything a whole lot easier, but just one person can get the job done. Expect to spend an hour to an hour and a half bringing everything together. Follow the picture based instructions in the box, and it will all flow together. The most common complaint against this grill is that eventually the electronic ignition goes out. This is a problem for many grills, and I personally do not know how to fix it. If your electronic ignition breaks, you can always light the gas with a match. One of the most finicky parts of the Char-Broil Classic Grill is the Grease Trap. As a whole, the grease trap works fairly well. Occasionally the grease will not drain correctly and be a pain to clean up, but this is a rare enough occurrence. The real issue is that the grease trap is dangling from this unit, and if jarred, will spill the grease and make a big mess. To get around this issue, always clean out your grease tray after grilling and you will avoid about 99% of potential problems. 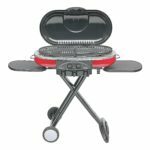 Looking for a Higher End Grill? The Weber Spirit E-310 will show you everything a gas grill should be. Unlike the Char-Broil, I can tell upon first use that the Weber is designed to last for a very long time. As a whole the Weber grill is far better designed and produced than the Char-Broil. Truly it is like comparing Coca-Cola to its Walmart brand competitor. The Weber Spirit will cost you more than twice as much though. Are you Just a Single Person or Husband & Wife Needing a Grill? The Char-Broil Classic 4 Burner Gas Grill is really designed for families. It offers a whole lot of real estate, and it would feel lonely I am sure if it was only cooking for one or two people. The Char-Broil Patio Bistro is designed explicitly for the bachelor or married couple in mind. It is more efficient, takes up less space on the patio, is easier to move, cleans up easier, and costs less to buy and operate. You will be trading grilling space for efficiency, but this is a fine trade-off if you never plan on grilling for more than four people at a time. The single biggest selling point of the Char-Broil 4 Burner Classic Gas Grill is its price. At under $200, this grill offers a tremendous amount of value for its price. While it may not be the best grill on the market, it gets the job done with flying colors. Just keep in mind that all grills have a lifespan, and this grill will get you through five years or so. For those five years, you will be enjoying perfectly grilled food straight from an attractive looking gas grill. Overall, I give the Char-Broil 4 Burner Classic 4 out 5 stars. “I successfully grilled steak to a nice medium rare, but I slightly overcooked hamburgers, while I perfectly grilled some hot dogs. Overall, I am very pleased with this grill as my first gas grill.” – Jon I.